We’ve been enthusiastic in the past about Grote Street’s Dumpling King. You get a huge pile of dumplings for not a lot of cash. However, Andy and I are also keen on Korean food (in particular, I’m a big fan of kim chi) so Mandoo, on Bank Street, has been on our radar for quite a while. Mandoo are Korean dumplings and this tiny restaurant focuses almost exclusively on just that (there’s bibimbap available, if you’re not in a dumpling frame of mind). We arrived at 6pm and this early start made our booking somewhat redundant, but if you want to go at a later time or on a more popular night of the week, booking could well be prudent. The restaurant also seems to do a pretty sharp takeaway trade. It didn’t take long for me to decide on the steamed kim chi dumplings, and Andy followed suit. Our dining companion ordered the beef bibimbap. Pretty much all the main courses are priced at $9.99, and the dumplings all come in serves of eight, accompanied by pickles, sauce, salad and cold mash (which tastes a lot better than it sounds). The dumplings are made in front of you, while the bibimbap appears from a kitchen at the rear of the restaurant. I was impressed by my dumplings on several fronts. Although steamed they are well enough stuffed and sealed so that biting in to them does not risk a mouthful of too hot water (something I do find a problem at Dumpling King). Also, the filling is finely chopped but has not turned in to a paste so there’s plenty of texture. The heat of the kim chi dumplings was good – especially when dipped in the sauce. Additional sauces are available (including gochujang, if the food isn’t spicy enough for you). I found the eight dumplings a good size portion – far more manageable than portions at Dumpling King. 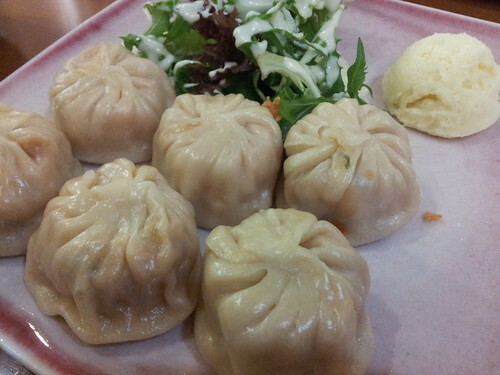 Both Andy and I were agreed that while the food is more expensive, and portions smaller, than at Dumpling King, Mandoo is a better experience – from the tables and service, through to the food.